This photo was taken in the afternoon in early November 2012 at NGR SN7584145002, looking east from Mynydd Mallaen towards Nant-y-Mwyn Lead Mine and the village of Nant-y-Bai. 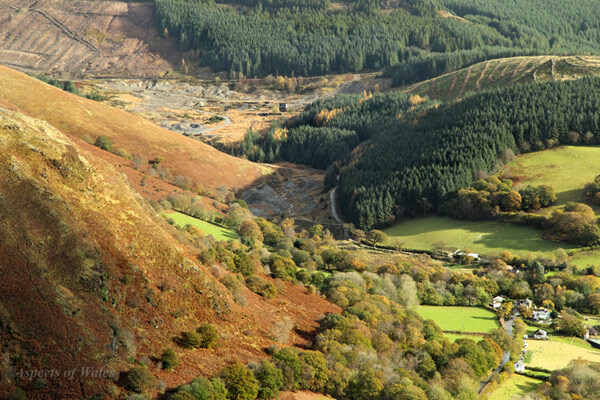 The stream in this valley, also called the Nany-y-Bai, is polluted with lead and zinc from the abandoned mine, which was once the largest lead mine in Wales. Canon EOS 600D, Canon EF-S 17-85mm lens at 80mm, Manfrotto tripod. Exposure F11 at 1/30 sec. Original image in Raw format.